Being a curious cat, I decided to investigate sand mold metal casting. Previous work installing a new water heater for my aunt left quite a bit of silver-tin solder droppings from working on the copper pipes. 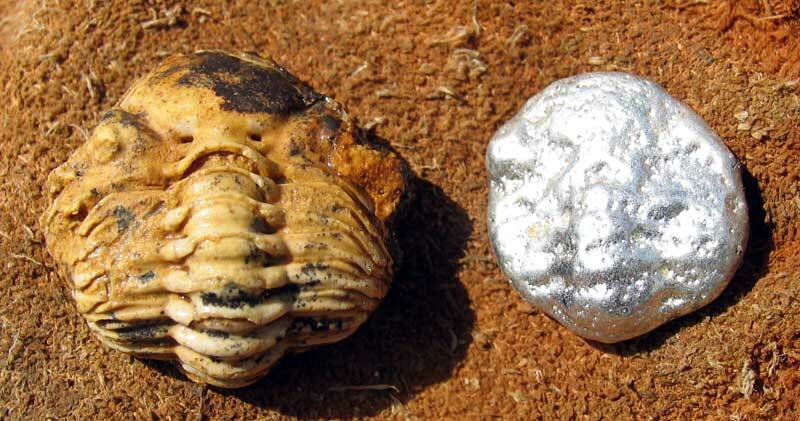 After reading a post by T-Rexy at the artistic dot dot dinosaur blog showing silver trilobite jewelry by Billy's a Bad Kitty, it made me wonder if I could make silver fossil replicas. I used silver-tin solder scraps for my experiments trying to mold fossil shapes in metal. In the end, silver metal clay is the material that should be used instead of trying to recycle plumbing solder. 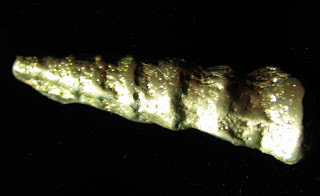 Below shows an attempt to replicate Turritella gastropod fossil from Alabama. First, when dealing with flames or soldering irons remember safety is the priority. During my metal working, I wore safety glasses and had on thick leather gloves. In addition, I worked with the metal inside a grill and used thick rocks and metal trays with sand as a medium to hold the molten metal. Extreme caution was used when dealing with this hot material and tools! 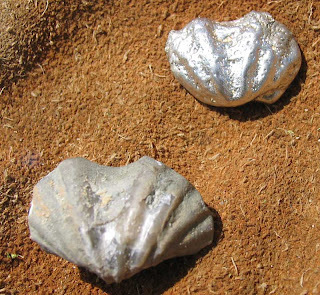 On of my molds involved the Silurian Period brachiopod Stegerhynchus? 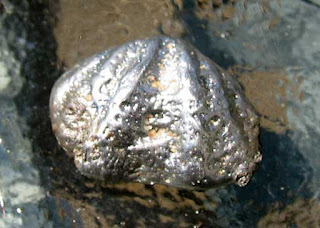 from the Waldron Shale of Clark County, Indiana. The first picture shows a result and you can see the pits made by grains of sand, maybe they can be polished out? A picture below shows the actual fossil and its silver-tin replica. I next tried the Phacops rana trilobite from the Jeffersonville Limestone of Clark County, Indiana. A few things became obvious at this point, detail gets lost in the sand and metal replica gets a lot smaller than the original. My last set of images show an experiment using a Flexicalymene trilobite from the Ordovician Period. 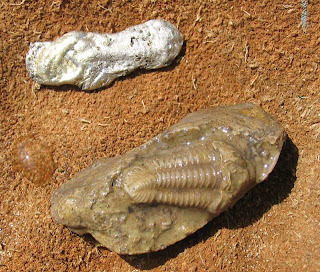 I used plaster to make this mold because the fossil is small. 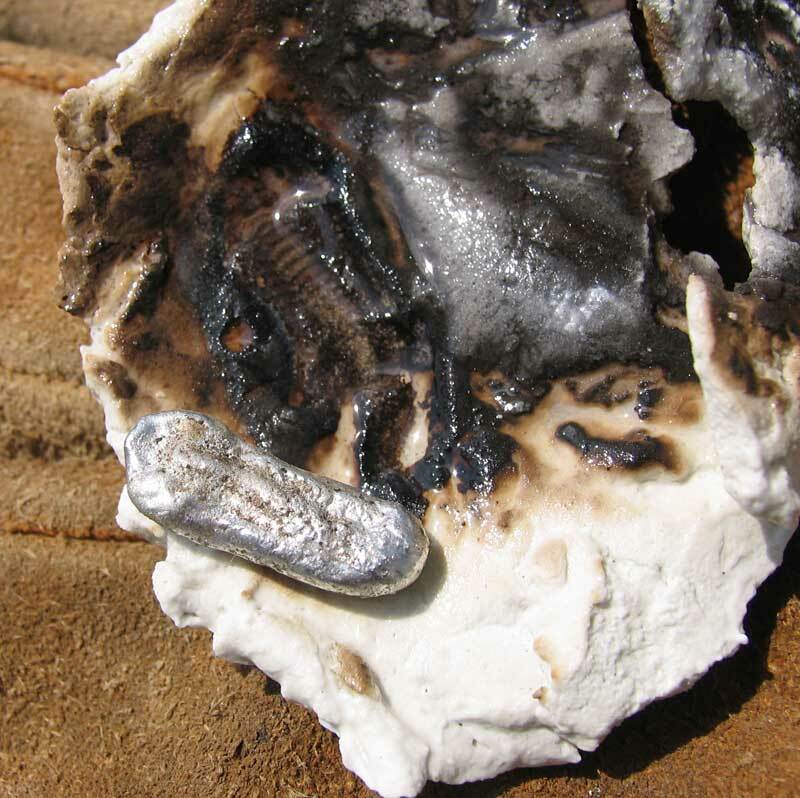 As you can see, the plaster got some what scorched while melting the metal.